Providing consulting services to law firms, high-growth businesses and startups, and mature companies in all areas of the Intellectual Asset and Intellectual Property lifecycle. We create business value with Intellectual Assets by helping create and protect new company growth. We do this by focusing the business to make better decisions by thinking at the intersection of IP, Business Strategy and Technology R&D. Executives: Creating understanding about how the IP environment in your industry impacts your current business choices. Developing IP that is directly linked to to support the long term goals of the company. Management: Creating IP roadmap and guidelines for a reference when making key business decisions. Staff: Increasing engagement and patent filings through education and use of KPI’s linking staff projects to IP goals. Patent teams: Creating best practices and deploying IP processes to increase efficiency of moving from ideas to granted patents. Utilize business cases for filing extensions. 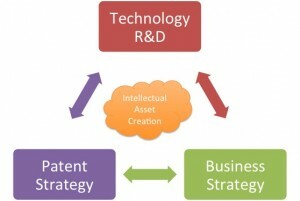 Project teams: Controlling costs of patents and R&D projects by quickly focusing teams on the relevant patent ideas. Legal teams: Identifying the claims and specification scope to ensure ongoing prosecution takes into account current and future business positions. As a result granted patents will be focused for market use. 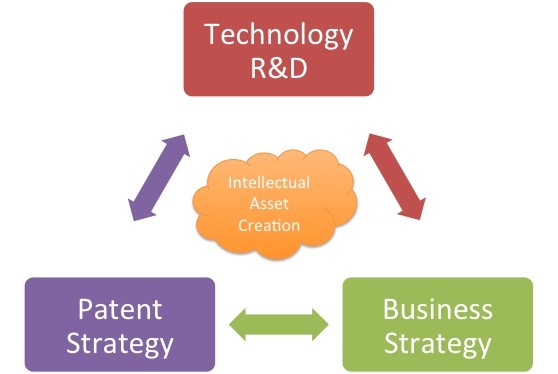 Innovation based services, which is often the start of creating a valuable idea, play a large part in shaping a full patent strategy. Understanding and integrating Design Thinking into your IP processes moves IP from a reactive state, to a pro-active state will offer higher returns for a business. Coaching and Method Training on Innovation (Lean Startup and IDEO Design Thinking methodologies), and linking to the long term patent portfolio growth.